The 6.4L equipped Ram trucks are a great alternative to a diesel powerplant. They make great power and provide awesome capabilities. For those who want more power or improved responsiveness with simple plug-n-play installation, the Pulsar is the perfect product! The Pulsar is an innovative product that ties directly into the PCM to add power, improve throttle responsiveness, and even program tire size without doing any PCM modifications or alterations to the vehicle. The Pulsar adds 25 HP and 40 LB-FT of torque to the tires! 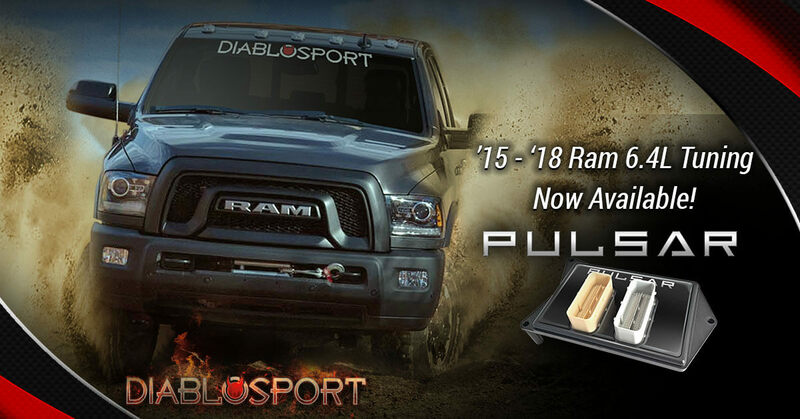 It is the only solution for the late model Ram trucks that doesn’t require PCM modifications. The Pulsar is also 50-State Legal and is covered by a CARB EO! The Pulsar, PN 32452, is as easy to install and even easier to operate. Simply use the cruise-control buttons on the steering wheel to adjust the power levels and control the options. It’s that simple. If you need to go back to stock, simply unplug the Pulsar from the PCM and you’re back at 100% stock with no alterations or “flags” in the vehicle. The Pulsar is the most innovative and groundbreaking product available for customers seeking easy and affordable performance! Equip your ride with Pulsar!